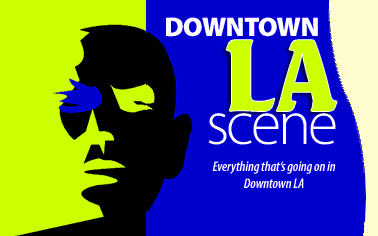 Downtown LA has a good article up on The Fly... including the creators' comments re: the Paris premiere a few weeks back. Read it here. It's still not a lock, but I thought I'd update the blog's header to reflect the current cover book cover. Any strong objections? WEDNESDAY, SEPTEMBER 3, 8:00 p.m. THE FLY is an extraordinary example of Cronenberg's particular brand of "body horror"; flesh transformed by disease. Seth Brundle (Jeff Goldblum) is an eccentric scientist, whose experiments with teleportation go awry, leading to one of the horror genre's most disgusting and gory physical transformations. Ultimately, David Cronenberg's version of THE FLY - based on a short story by George Langelaan and the 1958 film that starred Vincent Price -- is a dark romantic tragedy about the wasting away of a brilliant man who mutates into an insect as his loved one looks on helplessly. AFI, in association with the LA Opera, presents a brand new print , in the CINERAMA DOME, to coincide with the US premiere of the opera The Fly. Placido Domingo conducts the LA Opera-commissioned opera written by Oscar(R)-winning composer Howard Shore (LORD OF THE RINGS), with libretto by Tony Award-winning playwright David Henry Hwang (M. Butterfly). This also marks the LA Opera debut of Academy Award-winning production designer Dante Ferretti (THE AVIATOR, SWEENEY TODD). More information. A Q&A with David Cronenberg and Howard Shore will precede the screening. The list of musical success stories from New Zealand isn't exactly a long one. There's Split Enz, who became Crowded House, the Datsuns, Flight of the Conchords and... well, the score from Lord of the Rings was rather nice but that was composed by Howard Shore, and he's Canadian. Sorry for my scarcity this week... I've barely been home and am running on about 10 hours of sleep amassed since last Friday. If I owe you a phone call or an email, I promise I'll get to you soon. Black Book has posted a nice little piece on The Fly, primarily coming from the Cronenberg point of view. Click here. Variety's Jon Burlingame has posted two pieces this week, both of which mention Shore. Seen here is a genuinely wonderful examination of the increasingly blurred line between film composers and concert composers. I tend to cringe when this subject is broached, only because most journalists miss the mark and end up writing about composers' quaint struggles to abandon fluff and risk it all with the big boys. Burlingame is too smart for that. His piece respects film music and concert music alike, and asserts that a smart composer can bring something of worth to any field. Bravo, Jon! 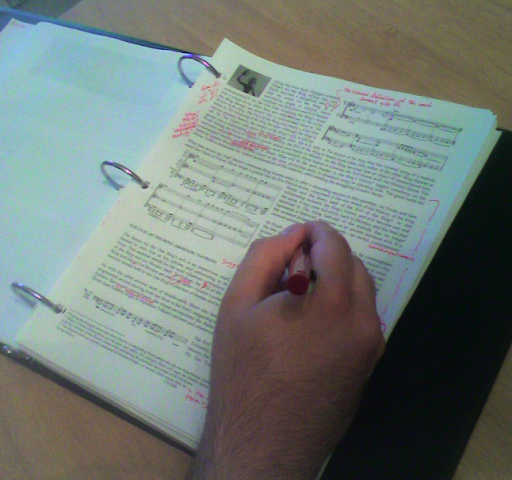 Shore gets less text in Burlingame's piece on videogame scores, but it provides a prime opportunity to mention the composer's work on Soul of the Ultimate Nation (a.k.a. S.U.N.). This is a fantastic score that plays like a sci-fi version of LOTR. Fans should make efforts to track this one down... which isn't always the easiest endeavor. 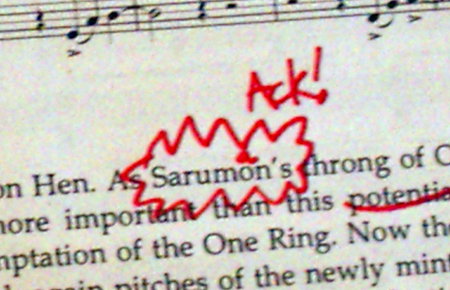 ...Oh yeah, and in Music of LOTR book news... I'm going to spent my weekend picking through music example graphics and requesting new ones that are based on material that never made it to the liners, but which the book will need. But first... it's power nap time! Looks like the Malaysian press is ready to join the LOTR bandwagon. Nice to see The Star highlighting the Symphony in a piece on the Malaysian Philharmonic's upcoming season. It took a good month and a half, but here--finally--is an intelligent, musically-literate review of Howard Shore's The Fly. Leave it to one of our own to pen the first comprehensive look at this massive work. Thanks to Jim Ware for taking the time to share his impressions with us. David Cronenberg's 1986 'remake' of The Fly has been among my favourite films for many years. I recall first watching it at the age of eleven and being truly repulsed and disturbed at its conclusion. The film introduced me to the decidedly warped imagination of David Cronenberg and by extension the music of Howard Shore. 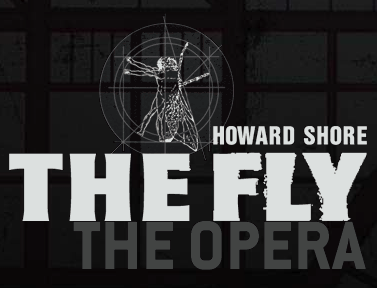 The opera version of The Fly has been in development hell for what seems like an eternity. The only undeniable facts during this period were the involvement of long-time collaborators Howard Shore and David Cronenberg. It seemed slightly surreal to be taking my seat in the Theatre du Chatelet in July of this year to witness the final performance of the Paris run. At this point I wasn't sure what to expect; I had heard brief snippets of the music but not enough to form any opinion of it. On the surface The Fly did seem well suited to becoming a stage production - both the size of the cast and the number of locations are limited - but how could the teleportation effects and Brundle's hideous physical meltdown be reproduced? During the lengthy development of this piece, both Shore and Cronenberg have been very quick to distance it from the 1986 film; in reality it shares a number of major elements, not least of which is the plot. Aside from a shift to the 1950s and a few minor adjustments it is identical in structure and content: the inside-out baboon is there, as are the arm-wrestle and Veronica's aborted abortion. All of the film's characters survived the transition, and some of them receive more character development than they did in 1986. If those references to the film weren't enough, David Henry Hwang's eloquent (and often very funny) libretto quotes significant amounts of the film verbatim. The shift of setting to the 1950s results in a very different look and brings increased analogue gizmo potential. The digital screens on the telepods feel a little anachronistic, but otherwise the staging is successful; the single set of Brundle's laboratory is repurposed into a hospital, a 50s dive bar and other locations with subtle assistance from the performers. The story has been divided into two acts, the intermission occurring as Brundle teleports himself - apparently successfully - between telepods to a chorus of 'long live the new flesh' (very Videodrome). Both acts play as continuous pieces with few strictly defined scene changes. Other alterations include the telling of the story in flashback as Veronica is interviewed by police and a twist at the end, which I will not spoil here. Fans of Howard Shore's majestic and lyrical work on The Lord of the Rings should proceed with caution - this is a very different insect. The opera opens with an excerpt from Shore's 1986 film score but this does not proceed as the listener might expect; dissonant brass takes over after a few bars to set the tone for the rest of the opera. Dissonance and atonality abound, and the music is almost universally grim throughout. In terms of orchestration it is reminiscent of Shore's work on The Aviator (minus the castanets) - there is a similar emphasis on heavy brass and complex contrapuntal writing. There are several sequences in the opera that can only be described as montages with overlapping orchestral, choral and solo lines building to a climax - the most impressive examples of these are the teleportation sequences. In these, Brundle's computer is 'voiced' by the chorus which chants numbers and statistics in a style oddly reminiscent of Einstein on the Beach. This was not the only element of the opera reminiscent of Philip Glass - The 'Particle Magazine Party' sequence towards the beginning of the first act is underscored with a series of whirling arpeggiations. This is one of the lighter parts of the opera and the libretto pokes fun at the supposed inadequacies of scientists. Other stand-out sequences include Brundle's rejection of Veronica - underscored with Shore's trademark bowed cymbals and uneasy aleatoric strings - and another post-arm-wrestle 'montage' as Stathis, Veronica and a scientist discuss Brundle's mysterious insect hairs while Brundle copulates wildly with Tawny in the background. Brundle's deterioration is perhaps the most moving sequence. The writing here is emotional but bleak, reminiscent of Shore's Looking for Richard. Brundle's physical meltdown is showcased with some appropriately gruesome latex costumes. They do not receive a huge amount of time on-stage but it must be a feat of endurance for Daniel Okulitch to wear such heavy latex and perform on a fully-lit stage. At over two hours in length the opera is longer than the film and the pacing seems to suffer as a result. The first act leading up to Brundle's transformation feels overlong, but Brundle's final deterioration in the second act is rather rushed. This is a minor criticism; it remains a compelling piece throughout. At its conclusion the audience responded enthusiastically with none of the negativity reported at previous performances. The Fly is recommended with reservations. It is more accessible than several of his other Cronenberg scores (Naked Lunch for example) but the unremittingly bleak tone and modernistic style may discourage some. If you can overlook that, it is a rewarding musical experience that will undoubtedly stand up to repeated viewings and listenings in the future. The 33 gigs of LOTR images have arrived, been sorted though, and are now implemented! It's amazing how insignificant 100,000 words looks all scrunched down into nothingness. That's ok, the bags under my eyes still tell the tale. Those of you having a difficult time with John Jennette's Scores of the Ring website over the past days will be happy to know that he's just posted in the Ongoing Discussion thread, and everything appears to be back to normal. Click here, and enjoy your visit! Though it's not yet a lock, it looks as if I'll be in LA the weekend of Sept. 13 and 14... both enjoying The Fly and doing a bit of Rarities Archives work with Mr. Shore. Anyone here planning on attending the performances that weekend? I may be able to arrange a preview or two for curious attendees. Drop me a line at the email link at top right. Not exactly breaking news here, but hey, it's been busy! The soaring Grand Court of the famous Philadelphia department store—home to the thunderous Wanamaker Organ—will be transformed into a magnificent concert hall. The Philadelphia Orchestra combines its resources with those of the Wanamaker Organ, the world's largest playing pipe organ. The organ has 28,482 pipes ranging from the size of a pencil to giants towering 32 feet tall. Performed for the first time is Jongen's Symphonie Concertante. One of the most famous organ-orchestra pieces, written for the Wanamaker Organ and the Philadelphia Orchestra in 1926, but to date has never been played on the instrument it was intended for. 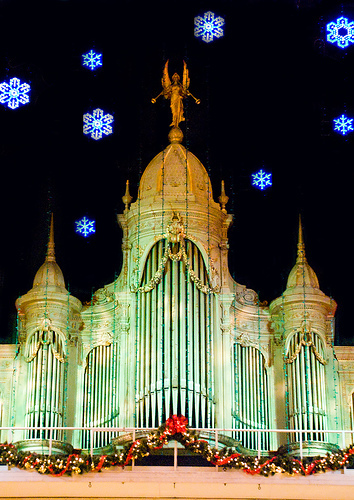 This event is co-sponsored by Macy's and by the Friends of the Wanamaker Organ, and is a benefit for the Friends. The event is part of Macy's official 150th Anniversary Celebration, and includes a new composition composed by Howard Shore. Shore wrote the music for 'The Lord of the Rings' films. Patrons purchasing tickets at $500 and above are entitled to a lavish pre-concert open-bar and hors d'oeuvres party amid the Gilded Age splendor of the Mayor's Reception Room at City Hall. They are also entitled to a Curators Tour of the Wanamaker Organ at Noon the following day, with light refreshments and wine in the Wanamaker Organ Shop at Macy's. Holders of tickets of $1000 or higher will receive a tax deduction for amounts above the $500 'base price' of the ticket. Tickets priced $200 and above are in prime seating areas in the Grand Court. Tickets priced $250 and above will have a direct Main Floor view of the orchestra. Lesser-priced seating is along the Grand Court upper balconies on floors two and three. Seating is extremely limited and demand for this rare event is expected to be exceptionally heavy—please purchase your tickets promptly. Read more or purchase tickets right here. Wasn't someone on the message boards planning on going? Does this mean we'll have another report to look forward to? It was hinted at long ago, but can only now be confirmed: The Lord of the Rings Symphony is on its way to Kuala Lumpur! What's more, it's also headed to South America, with a performance scheduled in Sao Paulo next autumn. See the right sidebar for details. The text lock mock-ups arrived from the printers today. You may note that we've stuck with the same cover that we used for early versions of the liners. I'm still not sure if it will last to the final version of the book, but it seemed a good place to start. Better six days late than never, right? 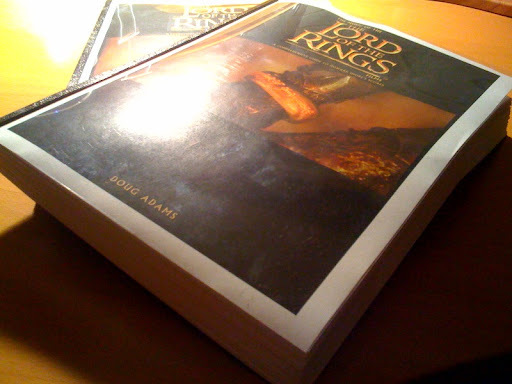 August 6 also officially marks the date upon which I've sent the locked text mock-up of the book to Howard Shore's offices. FedEx should have it there tomorrow afternoon. Let's hope it's met with approval!